Red-Caped Catholic Loons Protest Catholic College For "Sinful" Lesbian Wedding Photo In Magazine [VIDEO] - Joe.My.God. 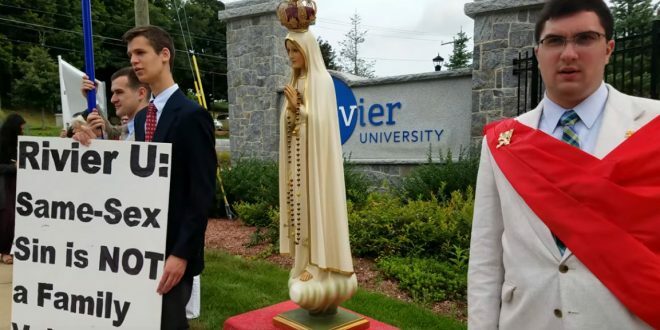 Rivier University, a Catholic institution in New Hampshire founded by the Sisters of the Presentation of Mary, published a “wedding” photo of two women kissing in the pages of its magazine, Rivier Today. Join the peaceful protest now. Urge the university to apologize for the following reasons. To restore respect for God. God’s marriage is only between one man and one woman. Homosexual unions are unnatural and 100% sterile and deprive children of their biological mothers or fathers. To restore trust and affirm moral values. Morality is the keystone of the family and society. If our Catholic universities no longer teach the truth — in word and deed — where will the next generation go to learn the truth? To stop confusing students. By publishing a photo of two women kissing on the wedding page of its magazine, Rivier University legitimizes sin, undermines Holy Matrimony, and causes scandal and confusion.